Plug your charging cable in either direction. Soft-glow LEDs illuminate USB ports to increase visibility in dark environments. Front indicator LEDs make it easy to know when ZUS is connected to your phone. Blinking LEDs mean that ZUS is ready to connect. Solid lights mean that ZUS has connected via Bluetooth. 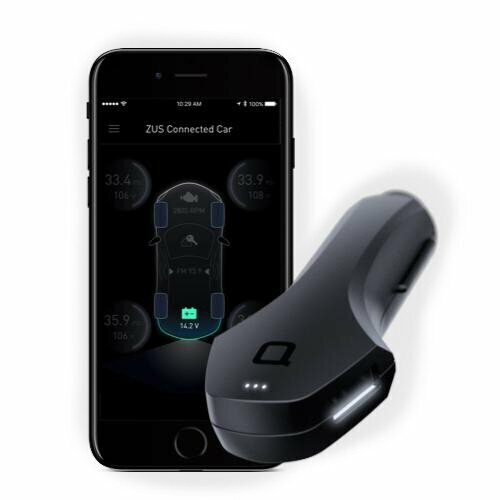 The ZUS Smart Car Charger is two times more durable than regular chargers and is the only car charger to meet U.S. Military Standard (MIL-STD-810G). Custom-designed connectors are coated in titanium for enhanced conductivity. Made from premium German Bayer polycarbonate, the ZUS Smart Car Charger is capable of withstanding extremely hot weather. The ZUS Smart Driving Assistant App automatically saves your parking location. Simply open the ZUS app to find your car with the Map or Compass.